A large blocking ridge dominates south-central Europe, while a potent upper low continues across the central Iberian peninsula. A weak wave travels along the northern edge of ridge across central Europe and supports convective activity along the difuse surface boundary. A large upper low over W Russia moves east with a short wave pushed across SW Russia and E Black sea. 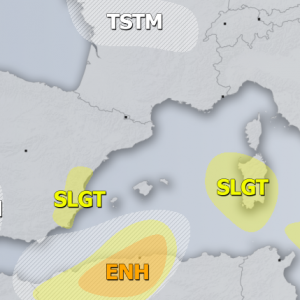 MDT/ENH risks have been issued for most of E-NE Spain with threat for widespread severe storms, capable of producing excessive rainfall, large to very large hail, severe winds and tornadoes. A quite similar convective evolution as a day before, associated by the potent upper low crossing Iberian peninsula. Moderate to strong deep layer shear ahead of the cold core will provide ample 40-50kt deep-layer shear for organized storms, fueled by moderate instability with MLCAPEs locally in excess of 1500 J/kg. Low-level wind field will be favorable for rotating storms given the 150-300 m^2/s^2 of SR helicity resulting from ESE LL jet. This will enhance tornado threat besides other threats as well. Storms will be widespread due to large scale forcing within the left-exit jet region. Clusters or storms are expected later in the period, spreading NE towards the Bay of Biscay and SW France. Due to rather slow eastwards progression of the frontal boundary and likelyhood of training cells, an excessive rainfall threat exists. 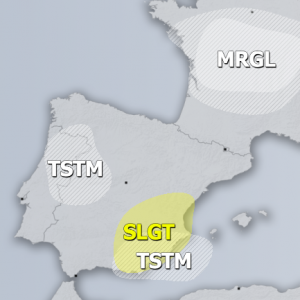 A SLGT risk has been issued for areas surrounding the MDT/ENH risks across E-N Spain, SW France, the Bay of Biscay and W Mediterranean into NE Morocco and NW Algeria with more isolated severe threat for storms, capable of producing large hail, severe winds and torrential rainfall. An ENH risk has been issued for far E Germany, Czech Republic, NE Austria, Slovakia, S Poland, east-central Hungary into NW Romania with threat for severe damaging winds, large hail and torential rainfall. A wave embedded in the strong WNW jet stream moves across the risk area through the day and support development of scattered storms by id afternoon, while some earlier activity is likely from the previous day activity coming from Germany. Moderate shear and rather high instability are supportive of organized severe storms. Quite fast moving storms should enhance damaging winds threat if bowing segments form within the more organized storms or small clusters. Storm initiation / re-development is expected first over Czech Republic and maintaining / organizing into Slovakia, S Poland and continue into Hungary later in the afternoon / evening hours. A SLGT risk has been issued for areas surrounding the ENH risk across E-S Germany, N-CNTRL Austria, S Poland, Slovakia, W Ukraine and NW Romania where severe storms are possible, but more isolated coverage is expected. Conditions should be quite similar to those within the ENH risk. Large hail, heavy rainfall and severe winds will be the main threats with the stronger storms. A SLGT risk has been issued for SW Russia where a weak SE-wards moving cold front serves as a focus for storm initiation, fueled by weak to moderate instability and moderate shear. These storms should pose some isolated threat for severe winds and marginally large hail. 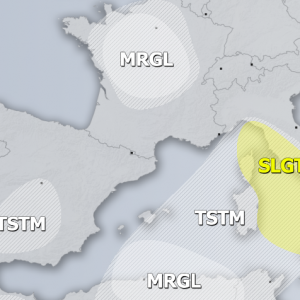 A SLGT risk has been issued for NE Turkey into Georgia with threat for isolated severe storms, capable of producing large hail, severe winds and torrential rainfall. Diurnal driven storms will form in moderately shear and MLCAPE by early afternoon and should diminish in the evening hours when instability vanishes.